Tissue engineering and regenerative medicine are potentially revolutionary approaches for replacing diseased or destroyed organs and tissues. Funded by the NIH, Professor Diane Dalecki and Professor Denise Hocking lead a multidisciplinary research program focused on developing ultrasound-based, enabling technologies for the fabrication and monitoring of functional, three-dimensional engineered tissues. 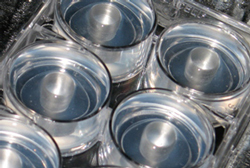 Tissue culture plates modified for ultrasound exposure of three-dimensional engineered tissues. The team is developing the use of ultrasound to regulate the structure and organization of the extracellular matrix in order to stimulate cell processes that are critical for engineering functional tissue constructs. Working with our collaborators, the team is also developing and applying new ultrasound imaging and tissue characterization techniques to noninvasively monitor the material and biological properties of engineered tissues.